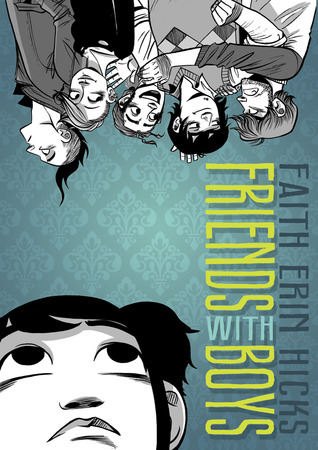 “Friends With Boys” by Faith Erin Hicks is very entertaining. It has a very different feel than all the other books I've read. It has two storylines which I like. One is high school drama, and one is ghost hunting. It's about a home schooled girl named Maggie whose mom has recently left the family and whose dad's the chief of police in their town. Since she has no mom to teach her, she has to go to high school. 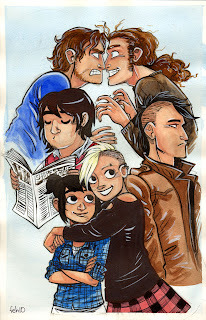 She doesn’t know anyone except for her three brothers, Lloyd, Zander and Dan. On her first day she becomes acquaintances with a punk girl named Lucy and her brother Alastair. They seem like the nicest people in school, and they are. She follows them to the graveyard one day. To Maggie, the graveyard is just another place that she lives by, but to Lucy, graveyards are a way to "get in touch with history." Alastair notices her and asks her if she would like to join them. While they talk, the subject of her mom is unknowingly brought up by Lucy. Maggie has to go. Lucy later wonders if she offended her in some way. The next day at school, Alastair apologizes to her for Lucy. He asks her if she would like to hang out with them. She agrees and Lucy is beside herself with joy. What a lovable character. Maggie and Lucy have perfect chemistry. Maggie is haunted by a nineteenth century widow, and Lucy is obsessed with ghosts. When Halloween comes around they go to the cinema to watch a screening of Alien. Lucy screams from the chestburster to the killing of the alien. After the movie ends, Lucy claims that the movie wasn't that scary. 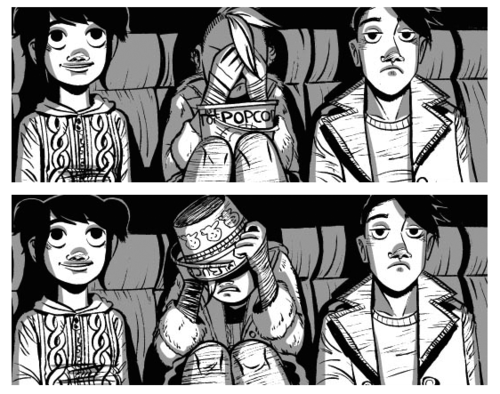 One of the cool things about Lucy is that she loves spooky ghosts, but is terrified of scary movies like Alien. Maggie becomes best pals with Alastair and Lucy. When Maggie's brothers find out of Maggie's friendship, they don't approve. A year ago, Alistair was best friends with the biggest jerk in school, Matt. Alastair was also very mean to Dan while he was friends with Matt, and Dan still hasn't forgiven forgiven Alastair. The town has a very nice ghost museum. When Maggie, Lucy and Alastair visit the museum they see a hand belonging to a sea captain whose wife killed herself when he died. Maggie remembers her ghost. The story turns in a different direction which I won't spoil. Faith Erin Hicks also illustrated a book I read called Brain Camp. I knew this just by looking at the drawing style. She gives a lot of detail to the nose of each character. Each character has a differently shaped nose. The eyes in Friends With Boys are very big, especially Lucy's. Lucy is definitely my favorite character. She really just has an innocent, likable personality. Also she looks just like my friend, Luna. I am home schooled just like Maggie used to be, but my experience is completely different than hers. One, my sister is not home schooled, two, I live in New York City and she lives in a small town, and three, I have a bunch of classes I can go to, she didn't. The biggest difference that I can see is that I have lots of home schooled friends, and Maggie doesn't. This book is appropriate for all ages above 11 as long as they can handle mild cursing, but there is still very little of that. I would have to give Friends With Boys 5 ghost ladies out of 5. I read this one when it was online and then bought a copy so I could read it again. 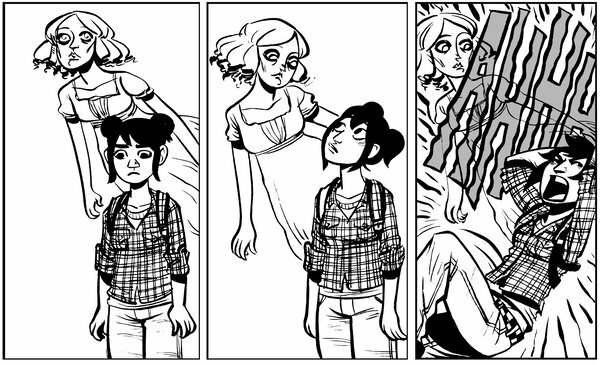 Did you know that the author is friends with Kate Beaton? She writes Hark! A Vagrant, which you may like now but will probably like a LOT in a few years. Thanks for The Rabbi's Cat recommendation, my kids and I enjoyed it! Very cool. I love the idea of a home schooler entering high school, and the friends she finds along the way. Speaking of ghosts, ask me sometime about the crazy Baker family that lived in the center of town and the ghost that was rumored to haunt the old captain's mansion where they lived (and, presumably, drove them crazy). Creeeeeeeepy. Sounds like another good one to order up especially coz it's about ghosts. Well and highschool. Just read Peanut and get to pick up Rabbis cat ASAP. Sure is good to have a place to look for graphic novels. I want to get this for my daughter. You write a good review -- just enough summary, and close attention to just the right details to give us a sense of how this story is told, and of the experience of reading the book. The way this friendship forms reminds me a little of the way Harry Potter found the Weasley family on the train to Hogwarts. His gut told him Malfoy was bad news, and that Ron would be a good friend. Thanks for bringing this book to my attention! When I was in school, getting a master's in school library media, we had to read and try to create short summaries like the ones published in School Library Journal and a few others like that. Anyway, your descriptions are much better than lots of the ones offered, and certainly better than any I wrote! Sounds like a good one. I know a few home schooled kids who have entered or re-entered traditional school and I'm thinking that a couple of them would like this a lot.